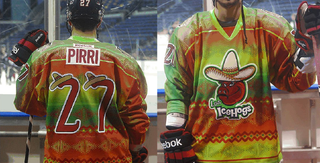 The AHL's Rockford IceHogs sure settled on a curious way to celebrate Hispanic Heritage Weekend. On Friday, Nov. 16, the IceHogs will be showing their respect for Hispanic culture and fans by wearing the jerseys above, showing Hammy Hog, the team's mascot, adorned with a sombrero and thick mustache. ¡Que racista! The idea of Hispanic Heritage Weekend was probably well-intentioned, but the end product is a disaster. Only dumb white people who can't think of a good Halloween costume still consider sombreros and mustaches to be signifiers of Hispanic culture. It doesn't just stop at the sweaters. If you visit the IceHogs' website, they're upping the ante on this ham-handed gesture by giving out maracas to the first 2,500 fans and hosting a special appearance from Dora the Explorer. White people!